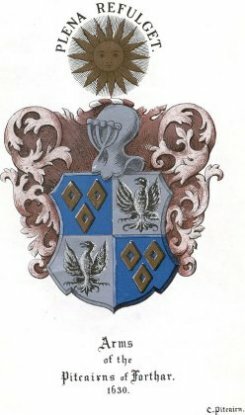 Janet Pitcairn, one of the two daughters of Henry Pitcairn of Forthar, he left no sons. Janet married Robert Balfour of Dovan, son of David Balfour of Dovan. A family agreement was entered into between Janet and her uncle, John Pitcairn of tht Ilk and Forthar, whereby in consideration of certain sums paid to her and others for the redemption of Dovan, she gave up her father’s share of Forthar-Ramsay to her uncle, and was herself infeft I the lands of Dovan. Patrick, son and apparent heir of Janet Pitcairn, one of the two daughters and apparent heirs of the deceased Henry Pitcairn of Forthir. Agnes Pitcairn, the other of the two daughters and apparent heirs of the deceased Henry. Patrick brings an action against “John Pitcairn, Agnes Ayton his spouse etc. They win their case on June 29 1589, the Lords of the Council decide that the said lands have been lawfully redeemed, and that the said defenders shall resign the same. Robert Balfour of Dovan and Janet she died May 1585, son Patrick of Dovan died 1596-7 and John of Dovan died before 1618 s.p. Patrick Balfour died probably in 1596, and thereupon ensued a dispute as to the succession to Dovan.